The play takes place in the mind of a middle-aged man named Marcel. It's a representation of his memories of his life when he was in love with a young woman named Albertine, along with his reflections on those memories. The audience experiences images relating to Marcel's memories from three monitors and from the actions and words of the other characters. The monitors are framed as a window (in which appear images that reflect the physical scene about which Marcel is thinking, e.g., a salon, a beach, etc. 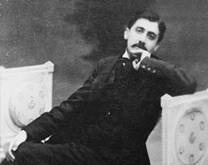 ); as a painting (in which appear images of period paintings that relate to what Marcel is experiencing); and as a mirror (in which, alternately, appear images of the person he was at the age about which he is reflecting and the manuscript which will become the book he will create from his memories; the mirror images are of Marcel Proust at different ages and of the manuscript which would become part of In Search of Lost Time). The identity of the characters other than Marcel is revealed by reference or context, and they appear indistinct because they are a product of memory. [bed, similar to above, remains the same throughout]. [somewhat smaller monitor appears as a painting, similar to above]. Shortly after each image appears in a monitor it begins to morph into the subsequent image. It's the story of a life … and a love ... about how people embody time … how they occupy a place where they touch – simultaneously the epochs through which they've lived. Is it "really like that" ? Is what you'll see and hear like what you find within yourself ? [bed appears very dimly lit]. [monitor image, as painting, gradually appears]. [monitor image, as mirror, gradually appears]. He's the uncle of a girl in a class a way below mine, the famous 'Albertine.' She's certain to be dreadfully 'fast' when she's older, but just now she's the quaintest spectacle. Gilberte is amazing, this daughter of mine. She knows everyone. I don't really know her. I only used to see her going about. I'd hear them calling 'Albertine' ... 'Albertine' ... But I do know her aunt, Mme. Bontemps. I don't like her much either. My niece Albertine is just like me. You've no idea how insolent she is. Yesterday, do you know what she said to the wife of the Under Secretary of State for Finance who told us she knew nothing at all about cooking? You ought to know all about it; your father was a scullion. Straight out like that! And she didn't give me a word of warning, the little minx; she's as cunning as a monkey. Sometimes the different periods of our life overlap. When I was a boy, there was a scene with my family because, being in the throes of love for Gilberte, I wouldn't accompany them to a dinner at which the Bontemps were to be present with their niece Albertine. She was still very young then, hardly more than a child. Anyway, I'd finally arrived at a state of almost complete indifference to Gilberte by the time I went on holiday with my grandmother at Balbec, on the Normandy coast. My former love lasted no longer than things do in a dream after one has awakened. At Balbec my old habits were no longer there to keep it alive, and a strange bed couldn't sustain the fancies upon which my love for Gilberte had fed. My journey was like the first outing of a convalescent who needed only that to convince himself that he was cured. At Balbec, all the young women seemed lovely to me. I was passing through one of those periods of youth, in which, having no one definite love, at all times and in all places one desires, one seeks, indeed, one sees only Beauty. All around me at Balbec - on the beach, in the Casino, at the ice cream shop – there were beautiful women. I was too shy to go anywhere near them, of course. Yet, I was still happy. I was like a child born in a prison, who having always supposed that people can only digest dry bread, has learned suddenly about peaches, apricots, grapes – that they aren't just decorations of the countryside, but are delicious food. Even if he isn't able to pluck those tempting fruits, the world still seems a better place, and existence in it more pleasant. A desire appears more attractive when we know that outside ourselves there's a reality which conforms to it, even if, for us, it's not to be realized. So from the day I first understood that the pretty girls who went past me on the boardwalk might be kissed, I became curious about their souls. And the universe seemed more interesting. I was just hanging about in front of the Grand Hotel, waiting for my grandmother to go to dinner, when I saw, projected against the background of the sea, five or six young girls coming towards me on the boardwalk. These girls were moving with a mastery over their limbs which comes from the union of perfect bodily condition with contempt for the rest of humanity. They were advancing straight ahead, without hesitation, performing exactly the movements that they wished to perform, each of their members in full independence of all the rest. And although I was soon to learn that they were all of respectable middle-class families, they appeared to me at first as if they might be the girl friends of professional boxers or cyclists. Passion can - more or less - be instantaneous. Let but a single feature—the little by which one distinguishes a woman seen from afar or from behind— let such enable us to project the form of beauty before our eyes, and our heart beats fast and we hasten in pursuit. As the little band of girls passed near me, I caught a smiling, sidelong glance from one of them, a dark girl with plump cheeks, who was wearing a polo cap. Immediately I sensed that this look was aimed from the center of an unknown world into which the idea of what I was didn't penetrate. If she'd seen me, what could I have represented to her? From the depths of what universe did she discern me? In the dark shadows of the eyes of such a girl, there shines the ideas that she cherishes about the people and places she knows - that it is she who is looking your way, with her desires, her sympathies, her revulsions, and her obscure and incessant will. I'd never possess this girl if I didn't also possess what was in those eyes. Consequently, it was her whole life that filled me with desire. I've often tried to recall how her name first sounded to me, when its form was still uncertain, when I'd not clearly distinguished it as designating one person rather than another. Vagueness and novelty are what we later find so moving when a name has become the first coherent sound that comes to our lips ... even before the idea of what time it is or of where we are ... almost before the word "I." It's as though the person whom it names is more "us" than we are ourselves. Today, it's still her sparkling eyes that I see. I could see that she had a tiny beauty spot on her chin. I was told later that she's called Albertine. And even though, when the countless images I've since had of her are superimposed upon one another, and I can run through them all without losing my grasp of one and the same person ... still, the more recent images remain separate from that earlier one. I can't confer on her retrospectively an identity she didn't have for me at the moment she first caught my eye. It was just an Autumn Sunday morning in Paris. But a simple change in weather can create the world and ourselves anew. As nature changes, we adapt our desires to harmonize with the new form of things. And that day, after a succession of mild days, there was a cold fog. At once, I was no longer the outward reaching - the centrifugal - being that one is on fine days. I was a man turned in on himself, a shivering Adam in quest of a sedentary Eve. Sir, Mlle Albertine is here. And there she was - smiling, silent, and plump, containing in the plenitude of her body, made ready so that I might continue living them, the days we'd spent together in that Balbec to which I had never since returned. Whenever we see someone with whom our relations have changed, it's like a juxtaposition of two different periods. And there's no need for a former mistress to call round to see us as a friend. All that's required is the visit of someone we've known in a certain kind of life, and that this life had ceased for us, if only a week ago. Albertine was like an enchantress offering me a mirror that reflected time, a time different than this misty afternoon. And so too, she embodied the passage of time. At Balbec, I'd always been surprised when I caught sight of Albertine, her appearance was so changeable. Now, she was scarcely recognizable. She'd changed over time. Freed from the pink haze that had shrouded them then, her features had emerged in sharp relief. There remained scarcely anything of the sheath in which Albertine had been enclosed and on the surface of which, at Balbec, her future outline had been barely visible. At last, she had a face. Albertine had returned to Paris earlier than usual that year. Typically, she didn't arrive until the spring. So already disturbed by the storms beating down the first flowers, I didn't distinguish, in the pleasure I felt, the return of Albertine from that of the fine weather. It was enough just to be told that Albertine had called at my house for me to see her again like a rose flowering by the sea. And truly, I can't say whether it was the desire for Balbec or for Albertine that took possession of me that afternoon. Maybe my desire for her was just a lazy and incomplete way of possessing Balbec. I've often thought that it's probably more reasonable to devote one's life to women than to postage stamps ... even to pictures or statues. But the example of other collections should be a warning to diversify, to have not only one woman, but several. I regret that I didn't have the sense to keep my collection of women as people keep their collections of old Italian glass ... never so complete that there isn't room always for another, even rarer still. It was a long time since I'd last been with Albertine, and I knew nothing of her life during the periods she abstained from coming to see me. These often lasted for quite some time. Then, one day, in she would burst. When she did, her visits left me little better informed as to what she might have been doing while she was gone. This was an interval which remained plunged in the darkness of a hidden life which my eyes, at that time, felt little anxiety to penetrate. Girls change very rapidly at the age Albertine had reached. Her intelligence was now more in evidence. And there were other attractive novelties too. I sensed in this pretty girl something that was different in those lines which, in the look and the features of the face, express a person's habitual volition. It was as though something had broken down the resistances I'd come up against in Balbec. I wasn't in love with Albertine now. But maybe she could satisfy the fanciful desire which the change of weather had awakened in me. "Lapse of time" seemed to augur better still. To my mind, that is the best thing that could possibly happen. I regard it as the best solution. Albertine's friends had gone on their separate ways, and at last I was alone with her on the boardwalk. You see, I'm wearing my hair now the way you like -- look at my ringlet. They all laugh at it and nobody knows who I'm doing it for. My aunt will laugh at me too. But I won't tell her why, either. Albertine's cheeks, which often appeared pale, now were flushed in a way that lighted them up, gave them that brightness of certain winter mornings when the stones sparkling in the sun seem to radiate joy. I asked her if the report of her plans which I'd overheard was correct. Yes, I'll be sleeping at your hotel to-night; in fact, as I've got a bit of a cold, I'll be going to bed there before dinner. You can come and sit by my bed and watch me eat, if you like; and afterwards we can play at anything you choose. We can spend the evening together and my aunt won't know anything about it. Come early; we'll have a nice long time together. I went to dinner that evening with my grandmother and felt within me a secret she could never guess. I didn't know what was going to happen that evening, but still, the hotel and the evening no longer seemed empty. Indeed, they contained my happiness. After dinner, I rang for the lift to be taken up to Albertine's room. The slightest movements of the bench in the lift were sweet to me because they were in direct relation to my heart. And I saw in the ropes that drew the cage upwards, in the few stairs that I had still to climb, only the machinery, the materialized stages, of my joy. Those few steps from the landing to Albertine's door I took as though I'd been plunged into a new and strange element, as if I was gently displacing a liquid stream of happiness, and at the same time, as if I were at last entering into an inheritance that had belonged to me from time immemorial. I'd be silly to be in any doubt. Albertine had told me to come when she was in bed. It was as clear as daylight. I ran towards my beloved's room. And, indeed, I found her in bed. Her white nightgown altered the proportions of her face, which seemed pinker than before, flushed , perhaps, by her cold. Her cheek was traversed by one of those long, dark, curling tresses, which, to please me, she had undone. She looked at me and smiled. Beyond Albertine, through the window, the sea lay beneath the moon. And the sight of her bare throat so intoxicated me that it destroyed the equilibrium between the immense and indestructible life which circulated in my being and the life of the universe outside me, so puny in comparison. The sea, and the sky in which the moon had not yet climbed to the zenith, seemed less than a featherweight on my eyes. All the life-giving energy that nature could have brought me would have seemed all too meager to express the immense aspiration that was swelling in my breast. I bent over Albertine to kiss her. Death might have struck me down in that moment and it would have seemed trivial. Life wasn't outside; it was me. I'd have smiled pityingly had a philosopher then expressed the idea that some day I'd have to die, that the eternal forces of nature would survive me, that after me there would still remain that sea, that moonlight and that sky! How could the world outlast me, since I wasn't lost in its vastness, since it was the world that was enclosed in me - in me whom it fell far short of filling, in me who flung sky and sea and moon contemptuously into the corner! "Stop! Stop it or I'll ring the bell! I told myself that not for nothing does a girl invite a young man to her room, in secret, arranging that her aunt should not know, that boldness rewards those who know how to seize their opportunities. Albertine returned from her aunt's a week later. I forgive you; in fact I'm sorry to have upset you, but you must never do that again. From that point on, as if, in place of a real girl, I'd known a wax doll, gradually my desire to penetrate Albertine's life disappeared. My dreams couldn't survive my belief that I might take her in my arms if I chose. And they found themselves at liberty to transmit themselves, according to the attraction that I found in her, or in another girl, on any particular day. Now, sitting in my room in Paris, I realized that not only did I no longer love Albertine, I no longer had to risk shattering a special affection for me in her, since clearly that no longer existed. Albertine had long since become indifferent to me; I felt no serious scruples. I'm not in the least ticklish. You could go on tickling me for a whole hour and I wouldn't feel it. Would you like me to try? Are you sure I'm not too heavy? Do you know what I'm afraid of? It's that if we go on like this I may not be able to resist the temptation to kiss you. That would be a happy misfortune. I didn't respond immediately to Albertine's invitation. Another man might well have found it superfluous. Albertine's way of pronouncing her words was so carnal that merely in speaking to you she seemed to be caressing you. But the invitation was highly gratifying in itself. That Albertine should be now so accessible gave me more than pleasure. It brought before my eyes images of Albertine as I remembered her on the beach, almost painted upon a background of the sea, having no more real existence for me then than a theatrical tableaux. Now, in my room, the real woman had detached herself from the luminous mass and had come towards me. At Balbec, I'd learned that it wasn't possible to kiss Albertine, that one might only talk to her, that for me she was no more a woman than jade grapes are real fruit. Now, here she was, appearing to me on a third plane, real as in the second experience, but available as in the first. And available, all the more deliciously, because I'd long imagined that she wasn't. Knowing that it was possible to kiss Albertine was a pleasure perhaps greater even than kissing her. What a difference between possessing a woman to whom one applies one's body alone, who's no more than a piece of flesh, and possessing the girl that you used to see on the beach, and trembled at the thought that you might not see again! Women who are to some extent resistant, whom one cannot possess at once, of whom one does not indeed know at first whether one will ever possess them, are alone interesting. A woman's body is most delightful when it appears as a silhouette against the back-drop of life. Albertine preserved, inseparably attached to her, all my impressions of a series of seascapes. And I'd have liked, before kissing her, to able to breathe into her anew the mystery which she'd had for me on the beach before I knew her. Human beings, however, lack certain essential organs, and possess none for kissing. For this absent organ we substitute our lips, and thereby arrive at a slightly more satisfying result than if we were reduced to caressing the beloved with a horny tusk. But lips, designed to convey taste, must be content with roaming over the surface and with coming to a halt at an impenetrable barrier. At the moment of actual contact with the flesh, the lips - in that desolate zone in which they are unable to find their proper nourishment - are alone, the sense of sight, then that of smell, having deserted them. And apart from photography, I know nothing that can to so great a degree as a kiss evoke, from something believed to be a thing with one definite aspect, the hundred other things which it may equally well appear to be. At Balbec, Albertine had often appeared different to me at different times. Now, in kissing her, the speed of the changes of perspective and coloring which a person presents to us through various encounters prodigiously accelerated. And during the brief journey of my lips towards her, it was ten Albertines that I saw. In kissing, our nostrils and eyes are as ill-placed as our lips are ill-made. Suddenly, my eyes ceased to see. Then my nose, crushed by the collision, no longer perceived any odor. And thus, without thereby gaining any clear idea of the appearance or the taste of the rose of my desire, I learned, from these signs, that I was, in fact, kissing Albertine. Whatever the modifications that had occurred recently in her life that might have explained why she now so readily accorded to a desire that at Balbec she'd refused with horror, Albertine now assumed an air of docile good will, an almost childish simplicity. Obliterating every trace of her customary pretensions, the moment preceding pleasure had restored to Albertine's rejuvenated features what seemed like the innocence of earliest childhood. In this new expression on Albertine's face there was an unexpected zeal. It was further than to her own childhood that Albertine had reverted. It was to the infancy of her race. Very different from me, who looked for nothing more than physical alleviation, Albertine seemed to feel that it would indicate a certain coarseness were she to think that physical pleasure terminated anything. Because she felt that kisses implied love and love took precedence over all else, Albertine seemed embarrassed at the idea of getting up and going immediately after what had happened; and I recognized in her a courtesy towards the host, a sense of propriety, and a respect for the bedside. Nevertheless, I insisted on Albertine going home. And finally, she did. It was as though Albertine was declining to admit that what had just happened might not be at least the prelude to a great friendship which we owed it to ourselves to discover. Since you give me leave, I'll send for you when I can. But it will have to be at short notice, unfortunately. I never know beforehand. Would it be possible for me to send round for you in the evenings when I'm free? Quite possibly, in a little while. I'm going to have a latch-key of my own. But right now it can't be done. Anyhow I shall come round to-morrow or next day in the afternoon. You needn't see me if you're busy. Albertine felt that now there was no need for coarse physical desire to prompt our caresses. Because our brief relations were of the kind that sometimes lead to a profound intimacy, she felt it incumbent to add to our kisses the sentiment they would have had for a knight and his lady as conceived by a Gothic minstrel. The terrible deception of love is that it begins by engaging us, not with a woman of the outside world, but with a doll inside our brain; she's the only woman who is always available, the only one we'll ever possess. One night, I arranged with Albertine to pay me a visit shortly before midnight. I'd be attending a party at the Princess de Guermantes' earlier that evening and I'd given Albertine a box to see Phèdre. We were at that torrid period of the year when, above all, one's sensuality seeks coolness. More than for a kiss, it thirsts for orangeade, for a bath, or even to just gaze at the juicy moon. Albertine's company reminded me of the coolness of the sea. Toward the end of the evening, I declined an invitation to join the Duke and the Duchess at a masked ball they were to attend after the party, so that I could be home not long after half past eleven which was when Phèdre ended. You're sure you won't come with us to the ball? ... Till we meet again, then. You do choose a funny time to receive visitors, young man! Come along, my dear, there's no time to waste. It's a quarter to twelve, time we were dressed. Is Mlle. Albertine in the house, Françoise? Albertine's visit now seemed all the more desirable for its being less certain. I retired to my room. Since Sir has come away from the party, he won't want to keep that rose in his button hole. I'll put it in water. It would have been better to let me take it than to go and spoil it like that. Anything that Françoise might say exasperated me at this point. When we're waiting for someone, we suffer so keenly from their absence that we can't endure the presence of anyone else. And Albertine's being at that moment somewhere that she evidently found more agreeable than being with me - somewhere of which I knew nothing – only increased my discomfort. Where I lived then, whenever the outer gate opened, the doorkeeper pressed a button which lighted the stairs. I went to sit down in the hall to where I could watch the stairway. If all of a sudden, the steps were bathed in a golden yellow, it would mean that Albertine had just entered the building; nobody else would be coming at that time of night. I dared not send round to Albertine's house - it was too late. I could do nothing but wait. And I couldn't help thinking that this was a quite a fuss to make about someone to whom I'd not given a minute's thought during the party! But by reviving the anxiety I'd felt in the past over other girls at the prospect of having to forgo a simple physical pleasure, Albertine's absence caused me real mental suffering. When we are kept waiting, from the ear which takes in sounds to the mind which dissects and analyses them, and from the mind to the heart, to which it transmits its results, the double journey is so rapid that we can't even detect its course, and we imagine that we've been listening directly with our heart. I'm not disturbing you, I hope, ringing you up at this hour? Not at all ... Are you coming round? Why ... no ... unless you absolutely must see me. I'm miles away from you now. I hadn't read your note properly. I'm so sorry. I just found it again and was afraid you might be waiting up for me. I felt sure that she was lying. And I was determined to make her come to me, wanting not so much to see her as to inconvenience her. The sounds that I heard in the background gave me Albertine like a clod of earth carried away with all the grass that was growing from it. But the sounds that I heard were also striking her ears and were distracting her attention. I've got to tell you that I don't in the least want you to come; at this time of night, it'll be a frightful nuisance ... And I'm dropping with sleep. Besides ... oh, well, there are endless complications. But there was no possibility of your misunderstanding my letter. You answered that it was all right. Very well; if you hadn't understood, what did you mean by that? I did say it was all right; only I couldn't quite remember what we'd arranged. But I see you're cross with me and I'm really sorry. I wish now I'd never gone to Phèdre, if I'd known there was going to be all this fuss about it. Albertine spoke as people always do when being in the wrong over one thing, they pretend to believe they are being blamed for another. I'm not in the least annoyed about Phèdre. Don't you remember? It was I who asked you to go to it. Then you're angry with me; it's a nuisance, it's so late now; otherwise I'd have come to you; but I'll call tomorrow or the day after and make it up. Oh, please, Albertine, I beg of you not to. After making me waste an entire evening, the least you can do is to leave me in peace for the next few days. I won't be free again for two or three weeks. Listen, if it worries you to think that we seem to be parting in anger - and perhaps you are right - then I greatly prefer that you come at once, since I've been waiting for you all this time and you've not gone home yet. I'll have a cup of coffee to keep myself awake. As I listened to these words, uttered as though she didn't intend to come, I felt that, with the longing to see her again, a very different element was painfully trying to combine. I'd learned to know this terrible need of a person when I was very young, as every afternoon, long before I'd have to go to bed, my bedroom became the fixed point on which my melancholy and anxious thoughts were centered. The concession which my mother made to my wretchedness was to come up to my room to give me the kiss of peace; and I felt as if I wanted to die if she sent word to me that she couldn't come upstairs because we had guests. Now I sensed that, somehow, that old sentiment was trying to combine and form a single element with the more recent one, the one which had for its object only the rosy complexion of a flower of the beach. No, I just told you that I won't be free for the next two or three weeks--no more to-morrow than any other day. She'd not believed that I would accept her offer. I don't care about your friend, Albertine. Either come or don't; it's up to you. It wasn't I that asked you to come; it was you who suggested it to me. Please don't be angry with me; I'm going to jump into a cab right now and I'll be with you in ten minutes. That evening, my past need for my mother and my present need for Albertine remained apart. But already I was beginning to understand that Albertine's life was situated at so great a distance from mine that I'd always have to make exhausting explorations in order to seize hold of it - that I'd never unravel the truth out of her tangled mass of fact and falsehood. When I returned to Balbec, my second visit was very different from my first. In the interim, my dear grandmother had died; and my mother was to join me shortly in the hope that the change of scenery would help relieve her from of some of the pain of that loss. I too was looking for a change; and since I'd not been to Balbec for some time, I felt that my sense of reality there wouldn't be destroyed by familiarity. In Paris, amid everyday surroundings, pleasure with a woman could never give me the illusion that it was opening the door to a new life. At Balbec, I knew that I was going to find myself in one of those places where fair strangers abound, where the transformation brought about by new female acquaintances would be easy, since now I'd be as well supplied there with friends and resources as I'd been destitute of them on my former visit. A few days after my arrival, the Manager brought me a message from Albertine. She wasn't supposed to be coming to Balbec that year; but she'd changed her plans, and she was staying ten minutes away by the tram, at a neighboring watering-place. I learned later that, fearing that I might be tired after the journey, she'd stayed away the first evening, but sent word now to ask when I could see her. I really wasn't interested; but Mamma, who'd met Albertine in Paris, insisted upon my seeing her because of the nice things that she'd said to her about my grandmother and about me. So I made an appointment with her. Your visitor has been here all this time. I must go down and tell her. She is not the sort of person to have here. A fast one like that, she may be gone again by now. She doesn't like to be kept waiting. Oh, nowadays, Mademoiselle Albertine, she's somebody! When she appeared, Albertine informed me that she'd be staying for the whole season and asked whether we could meet often, as in the former year. If ever you're feeling gloomy, or just want to see me, just send for me. Don't hesitate. I'll come at once. And if you aren't afraid of its creating a scandal in the hotel, I'll stay as long as you like. Eventually … I sent for her. It was on a morning of intense and premature heat; and the sounds of Balbec had traced within me, the scorching beach in which little waves came up, one by one, to sprinkle with their coolness. Suddenly I longed to hear Albertine's laughter and to see her silhouetted against the waves, as she remained in my memory, inseparable from the charm of Balbec. So I asked Françoise to find her, so we could spend the evening together. At this point, there weren't yet symptoms of that painful and perpetual mistrust which Albertine was to inspire in me – not to mention its special character. Still, I waited a little anxiously, and not for the first time. Françoise stayed away so long that I began to despair. Finally, she returned … but unaccompanied. I've been as quick as I could but she wouldn't come because she didn't think she was looking smart enough. If she was five minutes painting and powdering herself, she was an hour by the clock. You'll be having a regular scent shop in here. She's coming; she stayed behind to tidy herself at the mirror. There was still a long time to wait before Albertine appeared. But the gaiety that she showed on this occasion dispelled my sorrow. Monsieur ought not to see that young lady. I know quite well the sort she is; she'll make you unhappy. Our desires for different women vary in intensity. One evening, we can't bear to be deprived of one who, after that, will trouble us scarcely at all. And then there's the law of alternation: after an over-exertion of the flesh, the woman whose image haunts our momentary senility is one to whom we would barely give more than a kiss on the forehead. I saw Albertine seldom that season only when I felt I couldn't do without her. One day, Albertine and her friends implored me to join them at the casino at Incarville, but I declined initially since I intended that day to visit Mme. Verdurin, a matron with whom I'd become acquainted in Paris, and who'd invited me again and again to come to see her at Feterne, the villa she had rented for the season. But I was held up at Incarville by a breakdown of the tram which it would take a while to repair. 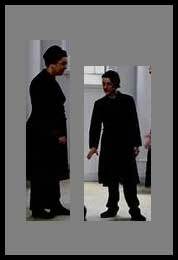 As I strolled up and down waiting for the men to finish working, all of a sudden I found myself face to face with Doctor Cottard, another acquaintance from Paris, who was also a friend of Mme, Verdurin. He'd come to Incarville to see a patient. And as we both had still some time before our train would be ready, I made him come with me to the little casino, where we were greeted with the tumult of Albertine and her friends who, in the absence of male partners, were dancing with each other. That's my friend, Albertine, and her friend Andrée. Don't they dance well together? Yes, but parents are very rash to allow their daughters to form such habits. I certainly would never let mine come here. Are they nice-looking, though? I can't see their faces. There now, look … I've left my glasses behind and I don't see very well, but they are certainly keenly aroused. It's not sufficiently known that women derive most excitement from their breasts. And theirs, as you see, are completely touching. The harm that Cottard's remarks about Albertine and Andrée was to cause me was extreme, but its worst effects weren't immediately felt. It was like a poison that begins to act only after awhile. Still, from that day, Albertine seemed different to me. The sight of her made me angry. There were moments of respite, but they lasted no longer than the healthy moments of sickly people who are subject to intermittent recoveries, and then are prostrated again by the merest trifle. Pained by suspicion, I would, eventually, succeed in banishing it. But no sooner was I cured than it revived under another form. One day, I saw Andrée lay her head lovingly on Albertine's shoulder and kiss her on the neck, half shutting her eyes. Immediately, Cottard's revelation struck home. Before that moment, it would never have occurred to me that Albertine was enamored of Andrée. The next afternoon, Albertine's friends saw with astonishment that Albertine was staying behind instead of accompanying them. Albertine, what are you doing? Don't you know what time it is? Will we see you again this evening? I don't know; it will depend on this person. Anyhow, to-morrow. There's a dual rhythm which love adopts in all those who have too little confidence in themselves to believe that a woman can ever fall in love with them. They know themselves well enough to have observed that in the presence of the most divergent types of woman they felt the same hopes, the same agonies, invented the same romances, even uttered the same words, to have deduced that their sentiments bear no close and necessary relation to the woman they love, that they pass by her, spatter her, surround her, like waves breaking on the rocks. And their sense of their own instability increases their misgivings that this woman, by whom they would so desire to be loved, is not in love with them. Why should chance have brought it about, when she is simply an accident placed so as to catch the ebullience of our desire, that we should ourselves be the object of a desire that is animating her? And so, while we feel the need to pour out before her all those so highly specialized sentiments which are a lover's, our hopes are overcome at once by the fear of offending her which brings into play the counter-rhythm, the reflux, the need, to deny our affection, to resume the offensive, and to recapture her esteem, to dominate her. The double rhythm is perceptible in all those whose self-analysis outweighs their self-esteem. I told Albertine that my concern was affecting my feelings for her. Of course, she denied everything. And she expressed a fierce curiosity regarding who had slandered her. If it were true, I'd have told you. But Andrée and I both loathe that sort of thing. We've seen enough women with cropped hair who behave like men and do the things you mean; nothing revolts us more. Albertine merely gave me her word; yet, this calmed me. Jealousy belongs to that family of morbid doubts which are eliminated by the vigor of an affirmation far more readily than by its probability. Love makes us at once more distrustful and more credulous, makes us suspect the loved one more readily than anyone else, and be convinced more easily than anyone else by her denials. We must be in love before we can care that all women aren't faithful; and we must be in love before we can hope that some are. The beloved is successively the malady and the remedy. As soon as a young woman arrived at Balbec, I proposed to Albertine the most distant excursions lest she make the newcomer's acquaintance. And I dreaded even more those women whose disposition was already known. One day, I remember, I noticed a handsome young woman on the beach, whose eyes scattered rays so geometrically luminous that one was reminded of some constellation. But the face of this young woman had been scoured by the invisible plane of a thoroughly depraved life; and her eyes could radiate nothing but appetite. I saw that she never ceased fastening them on Albertine as though she were making signals to her with a lamp. Albertine remained motionless; and eventually the other, with the same sort of discretion as a man who sees his old mistress with a new lover, ceased to look at her. It was if, in the face of Albertine's coldness, the young woman had felt the surprise of a foreigner familiar with Paris but not a resident, who returns to find the site of the little theater where he'd spent pleasant evenings occupied now by a bank. But usually, after dinner, Albertine would spring to my side with the light bound of a young animal rather than a girl; and like a dog she'd begin to caress me interminably. When night fell, heedless of the late strollers, we'd stretch out in the shelter of the dunes. I held pressed against my own the same body whose suppleness contained all the feminine, marine and sportive grace of the girl whom I had seen that first time against the horizon of the waves. And I'd return to the hotel with the first dews of morning still surrounded with the presence of my beloved. But the next day, as soon as I caught sight of Albertine, I'd be terribly afraid of her telling me that she wouldn't be free; and I'd gaze at her rosy face, tantalized by the enigma of her intentions which would create the happiness or misery of my afternoon. Are we going to be together tonight? ...a girl who could immediately replace my apprehension with a delicious sense of ease. [Young Woman utters words that are indistinguishable, but are "hoarse and brazen, almost dissolute"
What a delight to feel Albertine leaning against me, reminding me that it is always thus, side by side, that we find couples who are in love! Maybe I was in love with Albertine now; but I didn't dare let her see my love; if it existed in me, it could only be something like an abstract truth. Nevertheless, jealousy urged me to leave Albertine as little as possible; and I sometimes could even feel it in her presence. But when this happened, I'd then take care that the circumstances which had aroused it would not be repeated. There was that time when we went for lunch at a nearby restaurant where a waiter with a flushed face and black hair that writhed like flames was flying from end to end. He was in charge of a number of tables and sometimes far off, in the dining-room, at other times nearer, but out of doors, serving visitors who preferred to feed in the garden, one caught sight of him, now here, now there, like successive statues of a young god running. For a moment he was close to us and Albertine replied absent-mindedly to what I'd just said to her. She was gazing at him with rounded eyes. And for a minute or two I felt that one may be close to the person whom one loves and yet not have her with one. Albertine and the waiter had the appearance of being engaged in a mysterious conversation that was rendered mute by my presence and the sequel possibly of meetings in the past of which I knew nothing. And even when, forcibly recalled by his employer, the waiter withdrew from us, Albertine, while continuing her meal, seemed to be regarding the restaurant and its gardens merely as a lighted running-track, on which there appeared here and there amid the varied scenery the swift-footed god with the black tresses. At one moment I even asked myself whether she was going to rise up and follow him, leaving me alone at my table. I decided never to return to that restaurant; and I extracted a promise from Albertine, who assured me that she had never been there before and would never return. This, I now realize, might have been a peculiarly opportune moment for giving up a woman for whom one had not recently greatly suffered. I didn't see Albertine every day; but the hours we spent together brought into my days so sweet an intoxication that I was happy when I left her and I knew that the calming effect of that happiness would last several days. Tomorrow at eight-thirty, then. We mustn't be late, the others will be ready at a quarter past. …... and all my composure left. The conversation of a woman one loves is like the ground above a dangerous subterranean stretch of water: one senses constantly beneath the words the presence, the penetrating chill of an invisible pool. One perceives here and there its treacherous seepage, but the water itself remains hidden. I wanted to ask Albertine to let me see her the following morning, so as to prevent her from going to some mysterious rendezvous at half past eight which had been mentioned in my presence only in veiled terms. And undoubtedly, she'd have begun by obeying me. But she would regret that she had to give up her plans. And in time she'd discovere my permanent need to upset them. Then, for her, I'd become a person from whom one hides things. I'd failed during my first visit to Balbec to understand Albertine's character. I'd seen as frivolous her unwillingness to forego a garden-party, a donkey ride, a picnic. But during my second visit to Balbec, I began to suspect that this frivolity was only for show. I remember one afternoon when Albertine was making me the most passionate professions of affection. All of a sudden, she looked at the time and said that she had to go because she must call on a lady who was at home every afternoon at five o'clock, at nearby Infreville. Tormented by suspicion, I asked Albertine - I implored her - to remain with me. She said it was impossible; she could wait only five minutes longer, because it would annoy the lady who was far from hospitable, and – she emphasized - a perfect nuisance. But one can easily cut a call. No, my aunt has always told me that the chief thing is politeness. But I have so often seen you being impolite. It's not the same thing; the lady would be angry with me and would say nasty things about me to my aunt. I'm pretty well in her bad books already. She expects me to go and see her. But if she's at home every day? Feeling that she was blocked, Albertine changed direction. Yes … She is at home every day … But today I've made arrangements to meet some other girls there. It will be less boring that way. So then, Albertine, you prefer this lady and your friends to me, since, rather than miss paying an admittedly boring call, you prefer to leave me here alone. I don't care if it is boring. I'm going for their sake. I promised to bring them home in my carriage. Otherwise they won't have any way of getting back. I pointed out to Albertine that there were trains from Infreville up to ten o'clock at night. Quite true, but don't you see, it is possible that we may be asked to stay to dinner. She's very hospitable. Very well then, you just won't stay for dinner. That would make my aunt angry. Well then, you can dine with her and catch the ten o'clock train. That's cutting it rather fine. Really, Albertine, you know that I often go and dine in town and come back by train. But listen... We can do something quite simple, I feel that the fresh air will do me good; since you can't give up your lady, I will go with you to Infreville. Don't worry; I won't go as far as the lady's villa. I won't see either the lady or your friends. Albertine started as though she'd received a blow. How can you say such a thing! You know there's nothing I enjoy more than going out with you. Well … since we are going for a drive together, why not go out in the other direction; we might dine together; it would be so nice. After all, that side of Balbec is much the prettier. The fact is, I'm getting sick of Infreville. But your aunt's friend will be annoyed if you don't go and see her. Very well, let her be. No, it's wrong to annoy people. She won't even notice that I'm not there; she has people every day. I can go tomorrow, the next day, next week, the week after; it's all the same. Oh, they've cut me often enough. It's my turn now. But from that side of Balbec there's no train back after nine. Well, what's the matter with that? Nine will do perfectly. Besides, one needn't worry about getting back. We can always find a cart, a bike; if the worse comes to the worst, we have legs. "We can always find!" Albertine, how you go on! Out by Infreville, where the villages run into one another, well and good. But the other way, it's a very different matter. That way too. I promise to bring you back safe and sound. I felt that Albertine was giving up some plan that she'd arranged beforehand, that there was someone else who would be as unhappy as I was. Seeing that what she'd intended to do looked like it was out of the question now, and since I was insisting on accompanying her, she gave it up altogether. But she knew that the loss was not irremediable. Like all women who have a number of irons in the fire, she had one resource that never failed: suspicion and jealousy. She didn't seek to arouse them; quite the contrary. But lovers are so suspicious that they instantly scent out falsehood. And Albertine knew from experience that she could always be certain of meeting people again after she'd failed to keep a rendezvous. But I had no desire either to give pain to another or to enter upon a terrible course of unending vigilance. No, Albertine, I don't wish to spoil your pleasure; go to your lady at Infreville, or rather to the person you really mean to see; it is all the same to me. The real reason why I'm not coming with you is that you don't wish it. The outing you would be taking with me is not the one you meant to take, which is proved by your having contradicted yourself at least five times without noticing it. Poor Albertine was afraid that her contradictions, which she hadn't noticed, had been serious. It is quite on the cards that I contradict myself. The sea air makes me lose my head altogether. I'm always calling things by the wrong names. But very well then, it's settled; I'm off. And it's really bad of you. I willing to alter all my plans to spend a nice, long evening with you, and it's you that won't have it; and then you accuse me of telling lies. I've never known you to be so cruel … The sea shall be my tomb. I'll not see you see you any more. My heart leaped at these words, even though I was certain that she would come again next day … as she did. I will drown myself; I'll throw myself into the sea. There you go, insulting me again! You not only suspect what I say but what I do. But, my lamb, I didn't mean anything, I swear to you; you know that Sappho flung herself into the sea. Yes, yes, you have no faith in me. Perhaps Albertine was really heartbroken. Knowing what she was about at that moment better than I, she may have been afraid that I might refuse to see her again after the way in which she'd left. And I do believe that she was attached to me in her way and that the other person was even more jealous than I. But the idea of continuing relations with Albertine now appeared to me to be madness. I felt the desire to lead a new life. And I determined that I'd have things out with her. I would tell her that I wanted to travel, to visit Venice - this actually was true - and I'd let her understand that I was not in love with her. But I decided to briefly postpone this resolution because of a social engagement to which we'd been invited at the Verdurins'. Yes, that is if I don't "defect," because I'm beginning to find this sort of life really stupid. But assuming we go, so that my time at Balbec isn't absolutely wasted, I must remember to ask Mme Verdurin about something that could interest me a great deal and give me pleasure as well. The fact is I've really had very little of that this season. Well, that's not very polite to me; but I forgive you, because I can see that you're overwrought. What is this pleasure? That Mme Verdurin lets me hear some things by a musician whose work she knows. I'm acquainted with one of his pieces, but it seems that there are others, and I'd like to know if the rest of his work is published, and if it's different from what I know. My sweet one, if I tell you that his name is Vinteuil, will you be any the wiser? We may have resolved every possible idea in our minds, and yet the truth has never occurred to us. It's from outside us, when we are least expecting it, that truth gives us its cruel stab and wounds us for ever. You can't imagine how you amuse me, Not only does it mean a great deal more to me than you suppose, but I can get you all the information that you want. You remember my telling you about an older friend who has been a sister to me? The one with whom I spent the happiest years of my life, at Trieste, and whom I'm expecting to join in a few weeks to set out on a cruise together? Well, this friend – isn't this extraordinary? – is the best friend of your Vinteuil's daughter. I know Vinteuil's daughter almost as well as I know her. I call them both my big sisters. Your little Albertine can be of use to you in this question about music, about which you say - and of course quite rightly - that I know nothing at all. At Albertine's words an image stirred in my heart, an image which I'd kept, set aside, for many years. It was during one of the Easter holidays that my family used to spend at my grandparents house in Combray. There was a spell of hot weather; my parents had to go away for the day; and they told me that I could stay out as late as I pleased. I'd taken a long walk and ended up near where M. Vinteuil and his daughter lived. Their house was called Montjouvain. It was on the edge of a large pond, and was overlooked by a steep, shrub-grown hill. On the walks that I used to take with my family, we'd often meet M. Vinteuil's daughter. And after a certain year, we never saw her alone, but, always accompanied by a friend, a girl older than herself who had a bad reputation in the neighborhood. One day, this girl installed herself permanently at Montjouvain. Poor M. Vinteuil! He must be blinded by fatherly love not to see what everyone's talking about – a man who is shocked by the slightest loose word letting his daughter bring a woman like that under his roof. He says that she's a most superior woman, with a heart of gold, that she'd have shown extraordinary musical talent if she had only been trained. He can be sure it's not music that she's teaching his daughter. On that hot afternoon, following my long walk, I fell asleep among the bushes on the steep slope that rose up behind the house. It was almost dark when I awoke, and I was about to get up and return home; but then I saw Mlle Vinteuil who'd probably just come in. She was standing in front of me, only a few feet away, in a little sitting-room. The window was partly open; the lamp was lighted; and I could watch her every movement without her being able to see me. If I'd gone away just then, I'd have made a rustling sound among the bushes, she'd have heard me, and she might have thought that I'd been hiding there to spy upon her. At this time, Mlle Vinteuil was in mourning for her father who'd recently died and I watched as she flung herself next to the sofa just as there was sound of an approaching carriage. Presently, her friend came into the room. I know you'd like me to leave them open; you're always hot. But it's too tiresome! People will see us. When I say 'see us' I mean, of course, see us reading. It's so tiresome to think that whatever trivial little thing you do someone's eyes are on you. With the rectitude of her father, Mlle Vinteuil refrained from uttering the words which she felt indispensable for the full realization of her desire. In the depths of her being, a shy and suppliant maiden entreated and reined back a rough and swaggering trooper. Oh, yes, it's extremely likely that people are looking at us at this time of night, in this densely populated district. And what if they do see us? What if they do? All the better! ... I slipped quietly away. The idea of Albertine as the "sister" of Mlle Vinteuil and her friend was earth-shattering. It was a terrible terra incognita, a new phase of undreamed-of sufferings that was opening before me. I'd obscurely apprehended something akin to Albertine's friendship with Mlle Vinteuil when I became so uneasy at the sight of Albertine and Andrée together. But then I'd not been able to fully grasp the depth of my apprehension. It's often simply from lack of creative imagination that we don't go far enough in suffering. Still, the most terrible reality brings us, at the same time as suffering, the joy of a great discovery, because it gives a clear form to what we've long been ruminating without suspecting it. What I'd dreaded, what I'd vaguely suspected, what my instinct deduced from her whole personality, and what my reason controlled by my desire had gradually made me repudiate, was true! Behind Albertine I no longer saw the blue mountains of the sea, but the room at Montjouvain where she was falling into the arms of Mlle Vinteuil. I still clung to life. But I knew that I had nothing now but bitterness to expect from it. I shan't leave you any more; I'm going to spend all my time here. Albertine was offering me the sole remedy for the poison that was consuming me, a remedy identical with it. Albertine – my sickness – ceasing to cause me to suffer, left me – with Albertine the remedy – as weak as a convalescent. I wished now, above everything else, to carry her off to Paris. I might have reminded myself that in Paris, if Albertine had those tastes, she could find many other people with whom to gratify them. But every impulse of jealousy is unique and bears the imprint of the creature – in this instance Mlle Vinteuil's friend who aroused it. To Mlle Vinteuil, while her friend titillated her desires before flinging herself upon her, I now gave Albertine's inflamed face. How puny in comparison with the anguish I was now feeling was the jealousy that I'd felt when Albertine had gazed, with rounded eyes, at the flying waiter with the black hair! That other kind of jealousy, provoked by any young man, was nothing. At most, I had to fear a rival over whom I could have tried to gain the upper hand. But here the rival was not of the same kind as myself, had different weapons. I couldn't compete on the same ground, give Albertine the same pleasures, nor, indeed, even conceive of them exactly. At certain moments of our life we'd barter the whole of our future for a power that in itself is insignificant. In order that Albertine might not go to Trieste, I'd have endured every possible torment. And if that proved insufficient, I'd have inflicted torments on her, kept her under lock and key. I knew quite well that the localization of my jealousy was arbitrary, that if Albertine had these tastes, she could gratify them with others. But it was Trieste, that unknown world in which I could feel that Albertine took delight - in which there were her memories, her friendships - that exhaled a hostile, inexplicable atmosphere to me. It was no longer as a delightful place that I thought now of Trieste, but as an accursed city which I'd have liked to see burned down and eliminated from the world. Albertine, I want to go back to Paris. Won't you come with me? And stay with me for a while? I felt that at all costs I must prevent Albertine from being by herself, for some days at any rate, I must keep her with me, so as to be certain that she could not meet Mlle. Vinteuil's friend. She would as a matter of fact be alone in the house with me, since both my parents were to be out of town for awhile. Just as even when we are drunk we refrain from addressing the passers-by, for fear of blows, I wasn't guilty of the imprudence of telling Albertine that I was in love with her. I made only a vague allusion to the possibility of marriage, adding that it was quite impractical. I was too much inclined to believe that, from the moment that I was in love, I couldn't be loved in return, that something like pecuniary interest alone could attach a woman to me. But it wasn't Albertine; it was me; it was the sentiments that I was capable of inspiring that my jealousy made me underestimate. From this judgment, possibly erroneous, sprang no doubt many of the calamities that were to follow. Then you decline my invitation to Paris? My aunt wouldn't like me to leave just now. Besides, even if I can come, later on, wouldn't it look rather odd, my staying with you like that? Well … we can say that we're practically engaged. It can't make any difference, since we know it isn't true. The women whom I've loved most passionately have never coincided with my love for them. My love was genuine, but it was more because they had the faculty of arousing that love than because they were its image. I could find nothing in them which resembled my love. And yet my sole joy lay in seeing them. It was as though a virtue that had no connection with them had been artificially attached to them and that this had the effect of exciting my love. This was entirely distinct from the beauty, or the intelligence, or the kindness of these women. Like being shocked by an electric current, I've been shaken by my loves; I've lived them; I've felt them: but I've never succeeded in seeing them. Beneath the outward appearance of the woman, it is to those invisible forces with which she is incidentally accompanied that we address ourselves as to obscure deities. The woman herself does little more than put us in touch with these goddesses. The body of one's lover and the soul that inhabits it – can seem as if it's separated from us by just a few inches. But if something effects a violent change in that soul's position relative to us, something that shows that she's in love with others and not with us, then, by the beating of our dislocated heart we feel that it's not inches away but within us that the beloved creature is. That friend is Mlle Vinteuil! Albertine's words were the Open Sesame that let her penetrate to the depths of my lacerated heart, and I might search for a hundred years without discovering how to open the door that had closed behind her. While kissing Albertine, as I used to kiss my Mother in the evening, to calm my anguish, I almost believed in her innocence. But alone, back in my room, as I stood by my window, thinking of all the indifferent landscapes which were about to be lit up and which, only the day before, would have filled me with the desire to visit them, to travel, I heard myself weeping. And then Mamma was there. I came because I thought I heard someone crying. It woke me up. Why aren't you in bed? And your eyes are filled with tears. What's the matter? Mamma, listen, I'm afraid you'll think me very changeable. But I've recently spoken to you not at all nicely about Albertine. What I said was unfair. But what difference can that make? ... especially on such a glorious morning. Mamma wished that I not lose the benefit of the unfolding spectacle of the rising sun. But beyond the beach of Balbec, the sea, the sunrise which Mamma was pointing out to me, I saw the room at Montjouvain where Albertine, curled up like a great cat, had taken the place of Mlle Vinteuil's friend. What if they do see us? What if they do? All the better! Beyond the scene that was framed in the window, the other had drawn a dim veil, a vague image of memory and of dreams. But come now, you said nothing unpleasant about Albertine. You told me that she bored you a little. And you said you were glad you'd given up the idea of marrying her. There's no reason for you to cry. Through my tears, I'd been calculating the future and weighing my desires. I realized that such an affection as Albertine's for Mlle. Vinteuil's friend, one of such long standing, couldn't have been innocent, that Albertine had been initiated, that she now had a disposition in which she'd never cease to indulge - in which perhaps she was indulging at that very moment, taking advantage of an instant in which I wasn't present. Mamma, I'm not feeling well here; I want to go home. But listen to me. I was deceiving myself, and I deceived you the other day. I've been thinking it over all night and now I'm clear about it. I won't change my mind. Mamma, it's absolutely necessary that I marry Albertine!